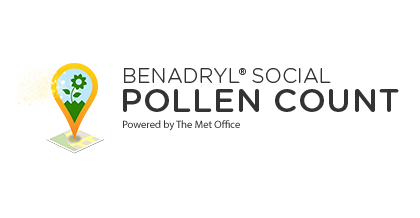 Find out exactly how pollen is behaving in your area right now with official Met Office data and live pollen alerts from fellow sufferers. 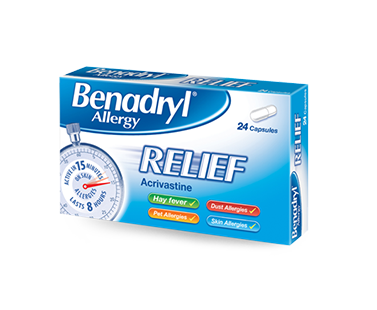 BENADRYL® Allergy Relief is the fastest-acting allergy relief capsule, it is the only brand to contain acrivastine a unique active ingredient. Acrivastine starts to work in 15 minutes providing fast relief. It can also be taken as required (up to three times per day) so that you can take as and when you need. This flexible dosing makes it suitable for dust and pet allergy sufferers who have short-lived allergy attacks, and for hay fever sufferers as it can be taken in the morning and evening when pollen is at its peak. Please read enclosed leaflet before first use.